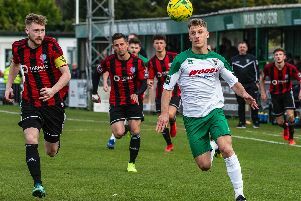 Miles Rutherford says the Chichester City management had to upset some players by leaving them out of their team - but deciding to go with a squad of 20 had proved key to their success. 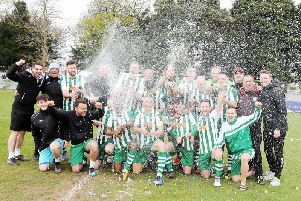 City clinched the SCFL premier division title with three games to spare with a 2-0 win at Oaklands Park, sparking great celebrations. See the match report here and a picture special here. Delighted manager Rutherford, who took over at City midway through the 2015-16 season, said, "Things have worked out for us this season. We decided to go with a squad of 20 players. We thought we might upset some players early on but we didn’t. We’ve had to deal with lots of injuries. We’ve had to leave people out the squad the last four games but they’ve stuck around. “As a manager you want to treat people in a way you’d want to be treated yourself. It was hard to decide we were going to go with 20 but we did and it’s worked out well for us this year and to be fair we’ve had a much stronger squad than we’ve had in previous years. “Yes, I’ve had to upset some people on the way but, you know, in football that happens and mainly we’ve kept the same squad and most people happy. We’ve got some good players and some people that do care. "We’ve won games lately 1-0, whereas at the beginning of the season we were winning games 4-0 and 5-0 and playing really good football. Recently we’ve dug in and won some games ugly but that’s what wins titles at the end of the day and we’re happy to be there. "Next year when we go up, if we struggle, we struggle. We’re not a club with a big budget. Some people think we’ve got lots of money but we haven’t. We’ve done this on a very tight budget. I think we’ve over-achieved for what we’ve got but we’ve got some very good players."